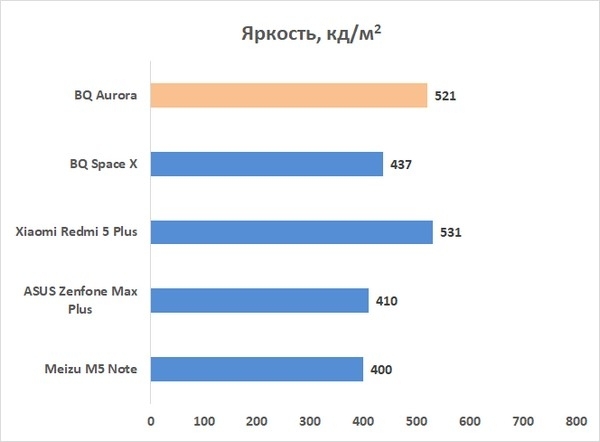 Aurora – this is the flagship family of smartphones BQ, despite the price of 15 thousand rubles. While the company avoids the high-price segment, focusing on the familiar budget niche, where she fared quite well. But with this model BQ goes into a full-fledged middle segment. 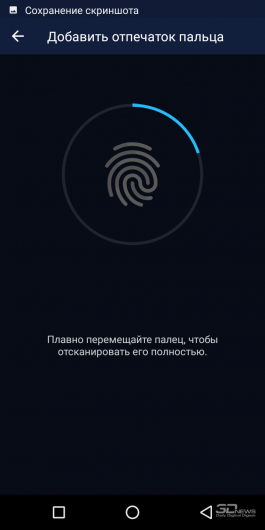 Helio P25 (as in much more expensive Meizu Pro 7), and the ability to unlock the device with fingerprint scanner and using the method Face Unlock (Yes, face), and cladding metal. The latter, however, has a positive impact on external perception of the device, but negatively to its capabilities: due to the decision of the BQ engineers had to once again abandon the NFC module. After meeting with several smartphones BQ last line we can even talk about a common style, and the family resemblance. Yes, modern phones don’t allow you to get fancy – it’s not dashing the 2000s, with a zoo of form-factors, so BQ doesn’t try to highlight your device from the masses. But the General style of decoration can be traced: the contours, the location of the camera unit and other functional items, the name of the smartphone on the back cover. Color variations available: classic black and gold. In the face of the Aurora you will not be too recognizable, but high quality and quite user-friendly smartphone. Despite the six-inch screen, the device did not work bulky for this say thank you to conditionally “frameless” (let small, but the framework is still there, of course) the construction and display format 18:9, stretched for the entire front panel. BQ Aurora quite successfully fit in almost any pocket, and as something special to learn to use it is not necessary. Although to work with one hand with a screen similar to the diagonal, in my opinion, it is impossible – even if I know people who can do it. Weighs “Aurora” a lot – 189 grams. Much more than her next of kin – BQ Space X. But for a six-inch smartphone is a quite normal figure: if you want a camera with a really large display, don’t be surprised that he doesn’t weigh as light as a feather. The control keys located on the right side and the screen (navigation pane, under display, do not place). Mini-Jack saved – there is even a formal reason to abandon it there: moisture and dust protection for Aurora stated. 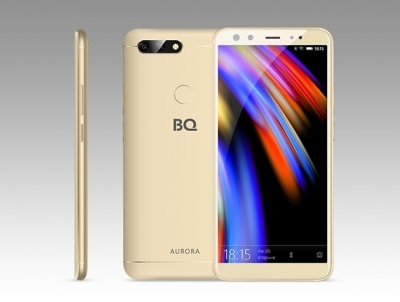 Unblock BQ Aurora in different ways: you can simply swipe the screen lock, enter a password, PIN or pattern, to put the finger to the fingerprint reader or use facial recognition. By default, the smartphone, despite the presence of more fashionable the Face Unlock feature, offers to use the fingerprint method. It is a traditional capacitive sensor, located on the rear panel in the center in place, which relate to the forefinger in its natural position. To use it comfortably, the sensor is very fast and almost error-free. 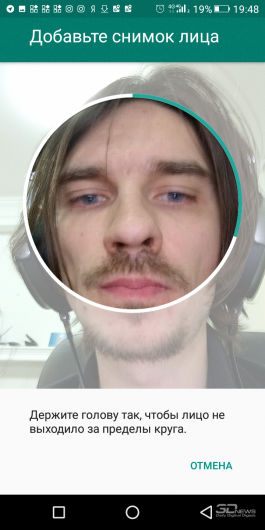 The facial recognition works fairly well, but not so fast – you have to take before smartphone screen pause for a couple seconds and wait for will. Fingerprint scan to use and more comfortable, and familiar. But if you want to unlock your BQ, Aurora “as the iPhone” — you configure this in settings Smart Unlock. 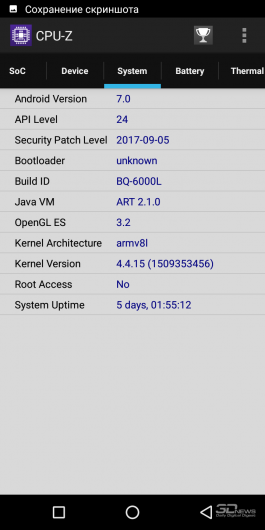 The smartphone comes with Android operating system 7.1.2 Nougat. 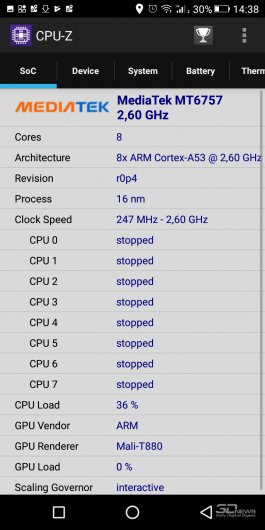 It is common for devices based on Google OS – integrated the latest version of the “robot” is derived not quick. 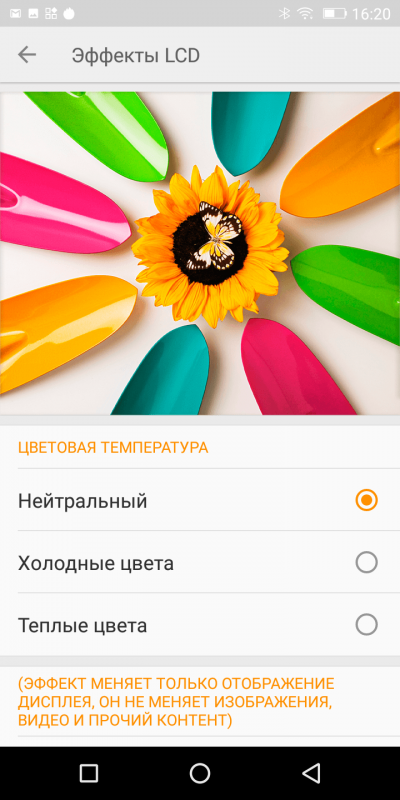 OSes are “covered” signature sheath, which features a large number of pre-installed applications: in addition to the system programs (clock, calendar and so on), here are installed third-party services: search string and browser Yandex UC Browser, Nine Store, the application “Vkontakte” and the charity Fund “give life”. 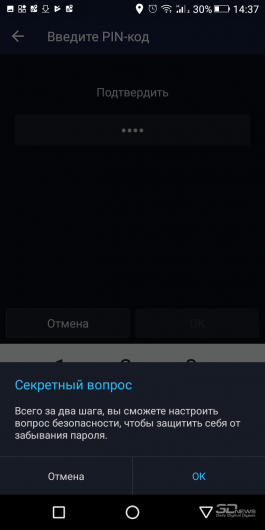 Moreover, the services integrated in the notification curtain, where among others you can find “Alice”, which announces the weather for tomorrow. 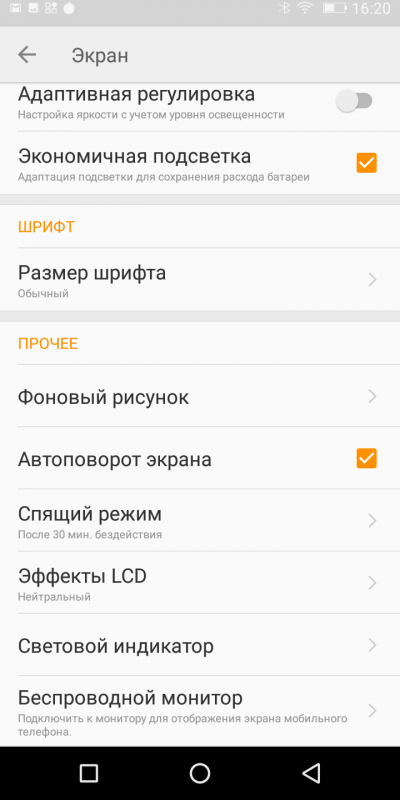 Another feature of the shell that blind with icons settings extends not from above, as almost all Android smartphones, and the bottom. Yes, a matter of habit, but a little hindrance to navigation virtual key – it is not always possible to nominate the first time. In the review of the BQ Space X, I complained about the stability of the shell – since then it has been updated externally, and in this respect, too. Any problems with the missions I already met. Speed is also quite good for a smartphone of this price category. 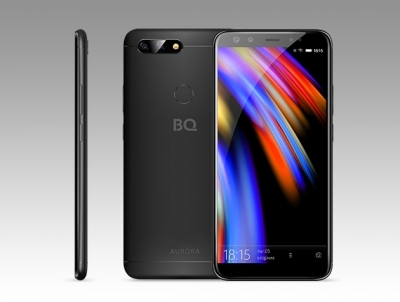 In BQ Aurora set IPS-display with a diagonal of six inches. Resolution – 1440 × 720 pixels. The pixel density in the end is 268 ppi – alas, to see the “ladder” on the fonts and other features the low resolution it’s easy. However, to call the problem of catastrophic I can’t – the picture is not very smooth, but the irritation is not exactly. Viewing angles are good, although unstable. In landscape orientation when you reject a view up or down is maintained and color reproduction, and contrast, and the deviation to the right or to the left decreases the contrast is already noticeable. Color at the same time in any case, are not distorted – it’s still IPS. In the winter with the screen it is possible to interact with gloves – this is a special mode of operation of the touch layer. For full performance of don’t count, but to accept a call or to scroll through the text. At BQ Aurora very bright display – 521 CD/m2. And made by all the canons: there are the polarizing layer and the air gap there. In the end, to use the phone under any conditions – on the sun it is not something that is not going blind, and even retains a good color. The smartphone is able to determine the brightness of the backlighting depending on ambient light, and depending on the current image. This allows to significantly extend battery life without sacrificing comfort of use – the device is able to adjust the lighting very carefully. Contrast – 1389:1. 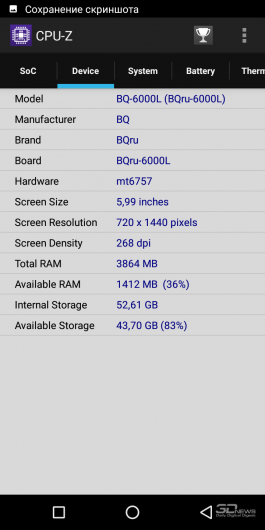 The IPS display is very good – you can count on a relatively deep black. Average gamma of 2.29 is that good. The curves on the chart are standard for a smartphone screen. But color temperature ranges from 8 000 to 10 000 K this means that the shades on the display is overly cold, but they can be corrected in settings: to make warmer or colder if you like this. However, the color gamut is not much impact – it is in any case will be significantly wider than the standard space sRGB. The average DeltaE deviation for the extended Color Checker palette (shades of gray + a wide variety of colour shades) is 7,39 – that’s a lot, but with the color gamut and color temperature and otherwise not expected. Accurate colour screen that boasts a BQ Aurora can’t. 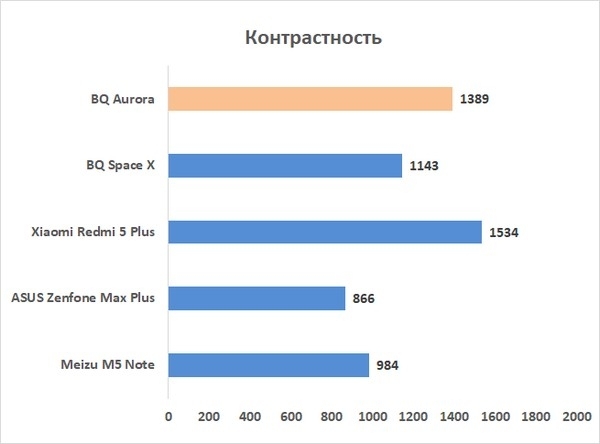 As I mentioned above, BQ Aurora has a mini-Jack – to buy new headphones specifically for this smartphone do not have. I have a good news supported with normal sound quality when listening to music through the wire. Wirelessly – no miracles, Bluetooth standard 4.2 without the extra bells and whistles for the transmission of audio data, that is, without aptX. A single speaker sounds very loud and does not overlap with your finger if you hold the smartphone in landscape orientation. To speak with Aurora is very comfortable.